On March 13th 2015 Daevid Allen, Age 77, one of the most original musical artists of this and the former century, exhaled for the last time. ”And so dada Ali, bert camembert, the dingo Virgin, divided alien and his other 12 selves prepare to pass up the oily way and back to the planet of love. And I rejoice and give thanks,” he wrote. “Thanks to you dear dear daevid for introducing me to my family of magick brothers and mystic sisters, for revealing the mysteries, you were the master builder but now have made us all the master builders. As the eternal wheel turns we will continue your message of love and pass it around. We are all one, we are all gong. Rest well my friend, float off on our ocean of love. The gong vibration will forever sound and its vibration will always lift and enhance. You have left such a beautiful legacy and we will make sure it forever shines in our children and their children. 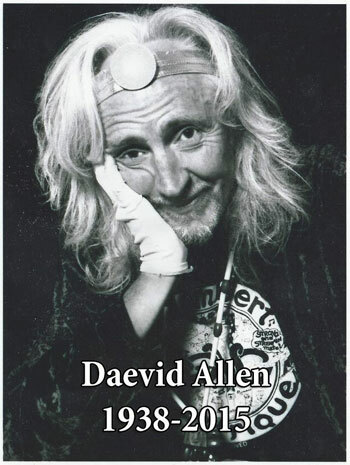 Daevid Allen was co-founder of the legendary fusion band Soft Machine, founder of Gong, instigator and master mind of and behind countless albums, songs, lyrics, stories, and he kept it going almost to the very end. Unknown to many, perhaps too many, his musical and artistic career made imprints on artists you perhaps later came to know and appreciate. He was a beacon of his time, he will remain a beacon while he himself has set out on what we know as, yet it might not be, the last journey. Or as expressed by his son “heading up the oily way”. Daevid Allen has been one of the most notable paradigm shifters in modern music, a musical dare devil with little interest in commercialism, in compromises between money and art, with equal interest in conveying his true musical self, his ideals, beliefs, in a most enchanting, reflected, thoughtful and entertaining way. “Wisdom delivered with humor, with imagination and substance, is wisdom well worth contemplating on“. Among his fans one will find all age groups. Trying to put him in a category would be downright impossible. Speaking for myself I don’t even know where to begin to describe how this genius and musical mastermind have influenced me, all up til today. As a hobby musician, still looking for ideas, avenues and ways to express, I frequently find myself returning to listen to music that bears the emblem of Daevid Allen. Via elder brothers I think my first contact with his music and musical contributions came in or around 1969 or 1970. I never was really taken by or interested in main stream music at the time, well not entirely. Guess that goes almost without saying about one who, at the age of 9 or 10, fancied Soft Machine and Gong in front of The Rolling Stones and The Beatles. There’s little left to say now except… Bon Voyage Master. Below his album from 1977 titled “Now is The Happiest Time Of Your Life”. This entry was posted in Art & Music related, Daily rant, this & that, Environment, life, politics and tagged Art, Music. Bookmark the permalink.